An entry-level line designed to aid the inexperienced caster. This weight-forward floating line is built a half-size heavy to help load the rod. Compact head helps to create positive leader turnover to deliver the fly to the intended target. New sleek and durable welded loop makes leader attachment quick and easy while holding up to repeated use. Helps to transfer energy more efficiently to the leader allowing better turnover. Built with Integrated Slickness-a patented additive that produces high line slickness for longer casts and reduced friction. Keeps lines cleaner longer to help with floatation and overall performance. 1. 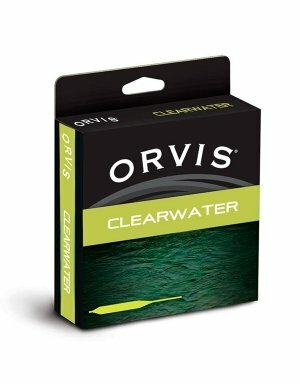 Orvis Line ID – Quickly and easily identify your line, no more guessing. All of our lines will be printed with the taper, weight, and functionality. 2. Enhanced Welded Loop – New sleek and durable welded loop makes leader attachment quick and easy while holding up to repeated use. Helps to transfer energy more efficiently to the leader allowing better turnover. 6. Core – Braided multifilament core provides excellent performance over a wide range of conditions. 7. Environmentally Responsible Packaging – Our new paper pulp spool, made from recycled cardboard and kraft paper, is 100% compostable and further enhances our commitment to protect our natural resources. In fluorescent yellow. Line sizes 3-9. Made in USA.